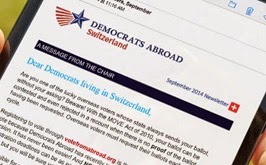 The 2015 Annual Meeting of the Zurich Chapter of Democrats Abroad Switzerland, with election of the Chapter Chair for 2015-2017, will be held in downtown Zurich on Saturday April 25. All members in the German-speaking region should download the ballot to vote for their preferred candidate for Chair, then send it in or bring it to the meeting! The two candidates for Chairperson are: Judy Brown and Renée Rousseau. Special guest will be DACH Executive Committee Member-at-Large Alison Bradley, who was a key organizer of the Democrats Abroad Vietnam 2012 Obama re-election campaign. Alison will give a presentation on DA Switzerland's recent activities, and 2015/2016 plans leading up to the 2016 Presidential elections, and invite your ideas.